In 2018 we will stay closer to home. Working with Habitat in Lebanon and staying at the Schrieber lodge at Camp Kirchenwald during the evenings. More details to come. 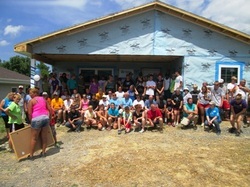 West Virginia to help homeowners and with foundations for new HFH homes and to make repairs on others. built a house in 4 days!! Our first meeting in preparation for our June trip to West Virginia to join "Almost Heaven Habitat for Humanity." If you would like to be part of our mission, you can pray for us, pray that we have safe travel, reasonable weather, the energy and strength to perform the necessary tasks to help families in need, and the ability to serve God with a joyful and willing heart. We are also raising funds so that we can build an entire outer structure of a house the week we are there including walls, siding, windows and roof. If you feel led by God to donate towards this mission donations can be mailed to Trinity Lutheran Church of Colebrook on 58 Church Road, Manheim, PA 17545. God bless you!